Known for her low-key lived-in style with flair, Schuyler Samperton has a knack for making rooms look like they’ve always been that way. She is an unabashed fan of color, pattern and spaces with a touch of idiosyncratic character. Patina and charm generally trump sleek and modern in her book, with a signature style that is a layered, comfortable West Coast mix of classic and modern with a bohemian twist. “Having my own line has always been a dream of mine, and with this debut collection I concentrated on the exotic, colorful patterns of India which I feel are at home in so many different settings. I also love the versatility of fabric and all the many ways one can include them in a room – upholstery, curtains, pillows and of course, my favorite – walls!” And may I add, tabletop. See how glorious (and different) Celandine looks above in Mulberry and in Sangria behind Schuyler in the top photo. 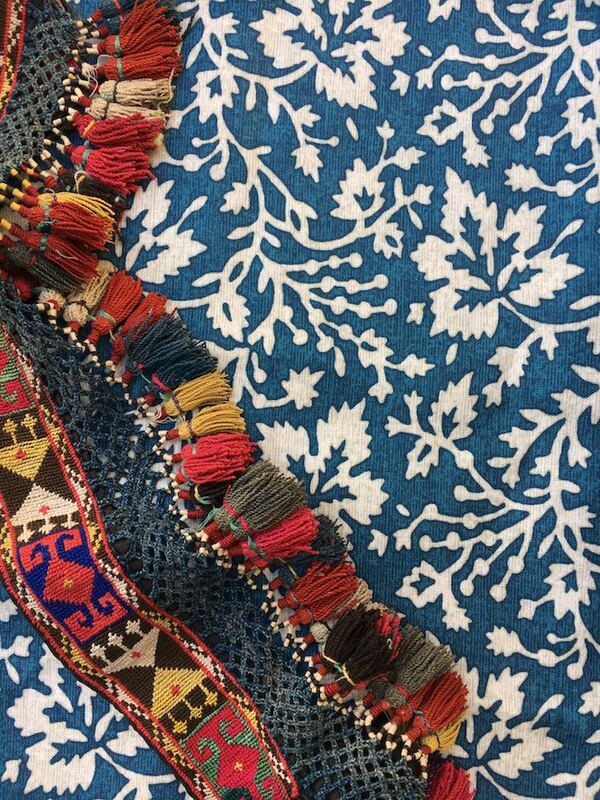 Just like Schuyler’s rooms, her textile collection is the perfect mix of old and new – patterns “rooted in history, but that also have a modern cheerful, bohemian spirit. 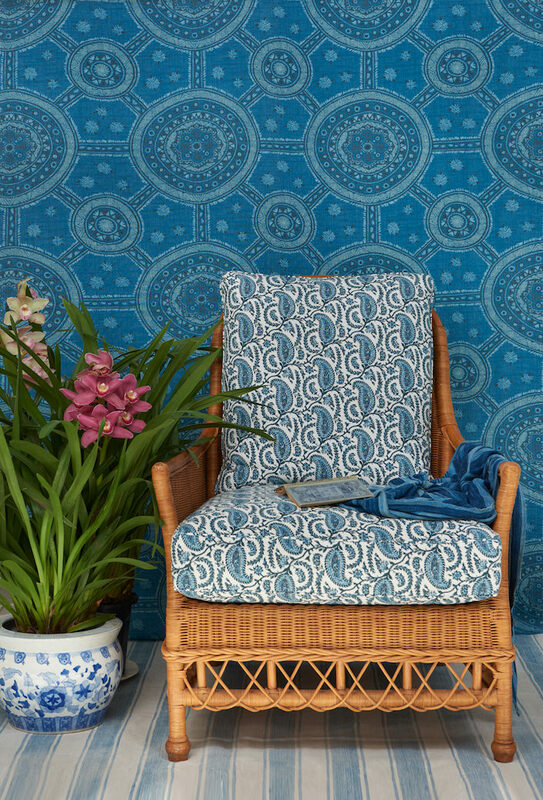 The coloration of each pattern was very important to me – I have several designs that are blue and white for those who prefer the more traditional (Cordoba in Clair on the chair, above, and Nellcote in Montego on the wall), but I also wanted to include more unusual options for those who were willing to push the envelope a bit and really go for it” Clearly Schuyler’s dog, Tricky, below, approves, sitting on one of my favorite patterns, Caledonia, with Doshi behind on the wall. 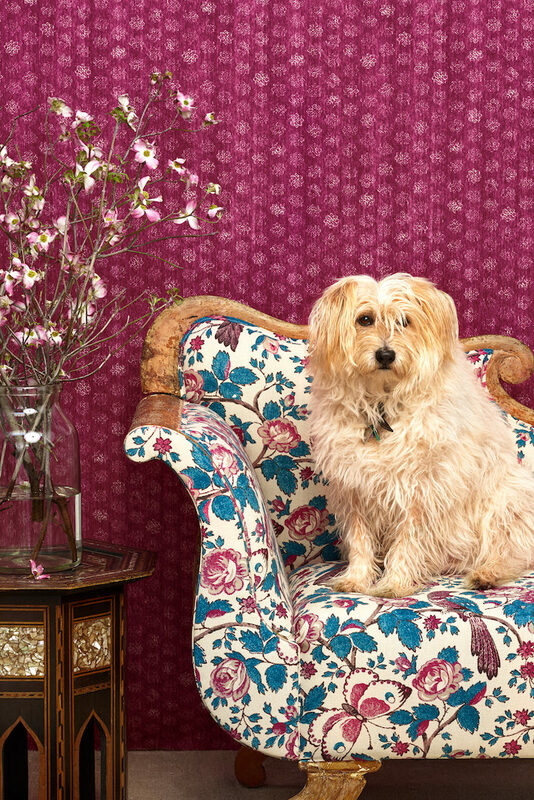 Schuyler’s beautiful new collection will be available as of May 9th at Hollywood at Home and be sure to look for Schuyler and Tricky this October in Dogs and Their Designers! This entry posted in design, interior design. 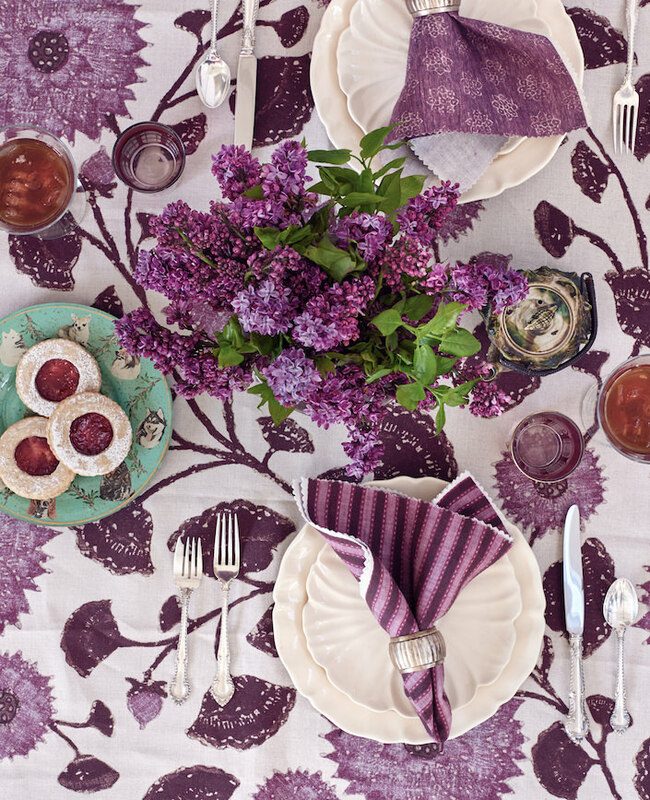 Entry Tags: Designer fabrics, Fabrics, interior design, Schuyler Samperton, Textiles Bookmark the permalink. I absolutely love the lavender one. Beautiful! Oooo, looks beautiful. I will be sure to take a look next week at the LCDQ event. Stunning. Deplaning for LCDQ and heading straight there! 80 queries in 0.485 seconds.